The Swarovski Lovebirds crystal figurine included a special Lovebirds Togetherness Certificate and custom Swarovski Togetherness Box. The crystal giant only offered the SCS membership to five English-speaking countries when it came about in 1987. For this reason, it was not necessary to have a multi-lingual Swarovski certificate for the Swarovski Lovebirds. Both variations of the Swarovski Lovebirds COA is identical on the front, and includes the same picture of the crystal figurine on the inside. The only difference is whether or not there is the authenticity information in French on the left side of the interior of the Togetherness COA. The Swarovski –assigned part numbers can be found on the back side in a very small font. The Swarovski Lovebirds English certificate is DO4E861. The Swarovski Lovebirds English and French certificate is DO4E86. The Lovebirds Certificate can also be found using another reference # DO1X861C, which was originally used in the Warner’s Blue Ribbon Books on Swarovski Price Guide. Swarovski Togetherness Lovebirds Certificate, Envelope on left, Certificate Front on Right.. The Swarovski Lovebirds COA was originally in a square white envelope when it was packaged with the crystal figurine. However, we do not commonly see the envelope when there is a sales transaction pending on the Swarovski Lovebirds. This original envelope is tissue-lined, and bears the Swarovski Collectors Society logo on the front side. 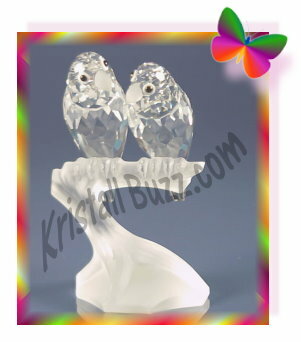 It is important to remember that the Swarovski Lovebirds does have a COA that is specific to this figurine. Less knowledgeable collectors have posted online auctions selling their figurine to include the original box and certificate, yet posted a picture of the Lovebirds with a generic product booklet instead. A special thanks to Jane Warner, co-author to Warner’s Blue Ribbon Books on Swarovski for consulting on the Swarovski Lovebirds Certificate article. Regarding availability and replacement value, the SCS Swarovski Lovebirds Certificate is on the more-difficult side to find. I was able to locate on ebay for $139 with free shipping. It is the English only certificate with the envelope. At Crystal Exchange America, the only listing for the Swarovski Lovebirds Certificate does not specify language is priced over $300 with their commission. Several days ago, I wrote about a limited edition Swarovski – Steiff Bear that was a spring 2012 release. 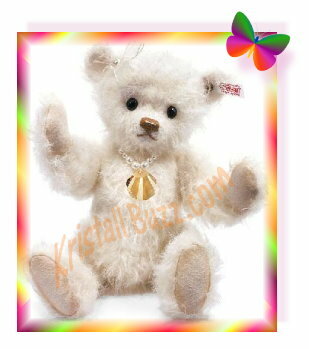 There is also another spring release limited edition teddy bear…the Swarovski Steiff Bear Shelly. Stieff’s description reveals that Swarovski Steiff Shelly white felted mohair teddy bear. The bear brand indicates that Shelly is ready for a wonderful day at the beach. At a glance, her pendant shell resembles the Swarovski Scallop in a topaz color, but at a zoomed in view, I don’t believe they are the same. The Swarovski Scallop was the 2006 gift when SCS members initially joined the Swarovski club or when returning members renewed their SCS membership. The scallop in 2006 was clear and went with the Swarovski Wonders of the Sea trilogy, which consisted of Swarovski Harmony in 2005, Swarovski Eternity in 2006, and Swarovski Community in 2007. Steiff Bear Shelly is a Limited Edition Bear with a maximum production of 1500 units. The Steiff USA web site and stores in North America are accepting orders for this Swarovski teddy bear. The suggested retail price on the bear is $240. 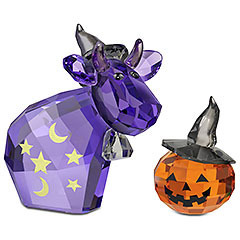 I found Swarovski Steiff Shelly in stock at a slightly lower price at Sunny-Bears.com . Crystal Exchange America has a few retired Swarovski Steiff bears, including Steiff Bear Crystal, Steiff Bear Jewels, Steiff Bear Poinsettia, and Steiff Bear Sapphire if you are looking for an older one. Swarovski Lovlots Emotis are Coming Soon! I recently found a Swarovski press release online, that announces the newest Lovlots, the Swarovski Bo Bears and the Swarovski Emotis. Swarovski Emoti Anger – This Lovlots Emoti Anger appears to be red with rage and steam rising from his brain, just as if he’s blown his top. Swarovski Emoti Curiosity – This Lovlots Emoti Curiosity obviously questions everything in the world….with one ear even shaped like a question mark. Swarovski Emoti Desire – This Lovlots Emoti Desire is burning with desire, with red flames shooting up from his hair. Swarovski Emoti Energy – This Lovlots Emoti Energy is being stricken by a lightening bolt, with a cloud hovering just above the eyes. 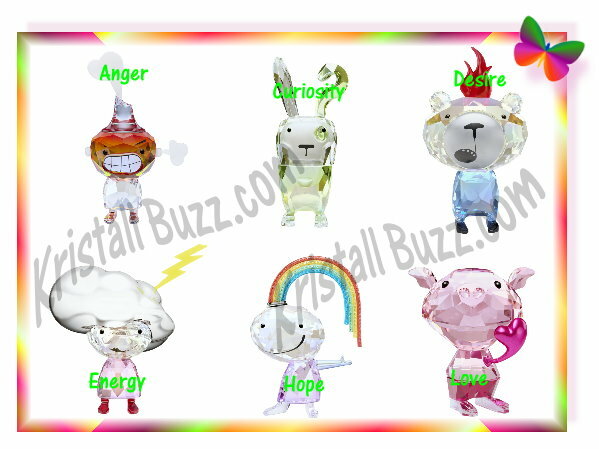 Swarovski Emoti Hope – This Lovlots Emoti Hope has a four-colored rainbow spouting from the head. Swarovski Emoti Love – This Lovlots Emoti Love is pink, and resembles a pig to me. Its heart appears to be pounding with love. These figurines, like the Swarovski Lovlots Bo Bears, will have other non-crystal components on them as well. Swarovski will combine faceted crystal with plastic, metal and epoxy for a more modern appeal. The Lovlots Emotis will not actually reside IN the Lovlots City, but rather in the clouds above them, hovering above the earth. Swarovski indicates that the Emotis community is invisible to the earth-bound characters, and cast spells on them. Such spells may cause Lovlots characters to become smitten, frustrated, or energized. The Swarovski news release did not provide details on a launch date, but I would expect it to be soon since the Bo Bears (in the same release) will be available in just a few weeks. Swarovski crystal fanatics may view a complete list of Swarovski Lovlots releases, 2006 through 2012 at the Crystal Exchange America web site.. I don’t really “get” these Lovlots Emoti figurines. I know that in the past, when the crystal giant produced people-figures, the figurines did not go over all that well with Swarovski collectors. Specifically, I’m referring to the Masquerade trilogy: Swarovski Pierrot (1999), Swarovski Columbine (2000), and Swarovski Harlequin (2001). And also the Magic of Dance trilogy: Swarovski Isadora (2002), Swarovski Antonio (2003), and Swarovski Anna (2004). It will be interesting to see how these new Lovlots are received by traditional crystal collectors and newer collectors too. Early last week, I shared information I found in a Swarovski announcement about their newest members of the Lovlots assortment ….Swarovski Bo Bears. Today, I have more information about the Lovlots Bo Bears! The official news from the crystal brand’s own web sites indicate that they will reside on the Lovlots Campus. The Bo Bears are a ‘contemporary interpretation of the popular teddy bear’. Swarovski Bo Bear – So Brilliant. So Brilliant Bo Bear will have 70 crystals set in the Pointiage® technique. Swarovski Bo Bear – Heavy Metal. Heavy Metal Bo Bear sounds like it may be a punk rocker, or perhaps the goth one in the group with his dark, skull attire. This one surely reminds me of the Soulmates Skull released in August, 2011! Swarovski Bo Bear – So Sweet. So Sweet Bo Bear is the ideal Valentine gift, a great way to say “I love you”. Swarovski Bo Bear – Naughty But Nice. Naughty But Nice Bo Bear will be ‘the one to watch’. It will be appearing as both an angel and a devilish figurine. Swarovski crystal fanatics can find out all the past and new Swarovski Lovlots releases, 2006 through present. The Lovlots Bo Bears are scheduled for release in their online shoppe July 9. Bo Bear Jewelry, Charms, and Accessories are set for release the following week July 16. Crystal collectors who enjoy the teddy bear crystal figurines can find hundreds of retired Swarovski Bear crystal figurines at Crystal Exchange America. Simply look in the Animals category or Lovlots category of their onine store. Steiff bear collectors and fanatics may be interested in a spring-release Steiff Bear decorated with sparkling Swarovski stones. This recent teddy bear is named Diamond (also known as Diamant Teddybär). The bear features a cream-colored coat of silk material. Diamond / Diamant wears a Swarovski gold-colored pendant with a Swarovski stone simulating a brilliant diamond. The bear has paws encrusted with Swarovski crystal Elements stones that reflect a rainbow depending on the bear’s surroundings. Steiff Diamond is a limited edition bear. There are only 2000 available. Naturally, the Diamond Steiff Bear can be purchased from the Steiff USA site. I noticed that the Teddy Bear company discusses a previous release Swarovski Steiff Sapphire in the promotion for Diamond / Diamant . Sapphire and the Diamond teddy bears do have their similarities with their paws decorated with Swarovski dust. Both bears being named after gemstones, I’m wondering if we are likely to see a Swarovski Steiff Emerald? Or perhaps a Swarovski Steiff Ruby? Remember, Diamond is a Steiff / Swarovski Limited Edition piece, so don’t delay your purchase if this is a teddy bear that you want to add to your Steiff collection or Swarovski collection. And if you are looking for an older bear, try Crystal Exchange America as they have a few retired Steiff bears. Swarovski has produced several koala crystal figurines from 1987 through present day. While we frequently hear people call them ‘koala bears’, technically koalas are not bears, so being correct and following the Swarovski naming convention, they will not be referred to as Swarovski Koala Bears, simply Swarovski Koalas. I do want to mention that this post is an update of an article I wrote in 1999 for a publication called “Crystal Wise”. So if it seems a bit familiar….that is why! The Swarovski Koala was introduced in 1987 with the part number is 7673 040 000 and system number 014 366. 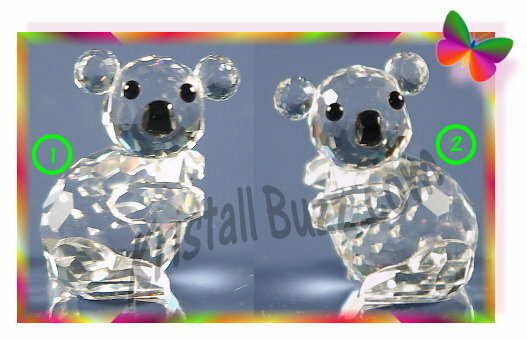 The Swarovski Mini Koala was introduced in 1989 with the part number is 7673 030 000 and system number 119 472. Both were made in left facing and right facing variations so today, there are four different of these two Swarovski Koalas. In 2009, the crystal brand introduced another figurine called Swarovski Koalas with part number 9100 000 121 and system number 955 423. At present, only the Swarovski Koalas can be purchased from the online shoppe or other dealer. Before we get you too terribly confused, I’ll tell you what I tell my customers to help determine Left vs. Right facing positions. And since I am in the US, I’m going to assume you are driving a car in the US. If the koala is driving a car, with his hands/paws on the steering wheel and feet on the pedals …. Is he looking out the driver window, or is he looking at the passenger? If he is looking out the driver window, he is facing LEFT. If he is looking at the passenger, he is facing RIGHT. Now perhaps I’ve confused our fellow drivers who drive on the wrong side of the car and on the wrong side of the road …. oops ….l mean the opposite side of the car and opposite side of the road. I hope you folks can pretend you’re here in one of our cars to figure out which koalas are which. Now you probably wonder why they face different directions? The Swarovski Koala (7673 040 000 / 014 366), the left facing one (#2 in the image) is made in Europe. His ears are set lower on his head and his shoulders are rounded with a straight edge for the paws. The right facing one (#1 in the image) was made here in the US. His ears set much higher on his head. His paws are rounded with a straight edge at the shoulders. The arm stone was simply put on in a reverse direction on these two different animals. In 1993 when Swarovski America ceased putting together pieces and began receiving everything already assembled, that is when the US began seeing the left facing variation of the Swarovski Koala. The story on the Swarovski Mini Koala (7673 030 000 / 119 472) is more interesting. This information I learned from a former Swarovski employee who saw first-hand what was occurring. To assemble the various Swarovski pieces, a set of “blue prints” is needed. It tells each stone that is required and shows where the stones should be placed to assemble the piece. When the blue prints arrived here in the US for the mini koala, they somehow got “reversed’. The people on the assembly line saw the blue prints and put them together opposite of those assembled in Europe! When this discrepancy was brought to the attention of the management, decisions were made assemble it “right facing”. When the assemblers got confused, they would pull one off the shelves and assemble it to match …and if it happened to be facing left ….the new one would be assembled as such. This vicious circle happened several times before a final correction and decisive action was made to ensure that all mini koalas were facing right. By the second year of production, they were all made facing right (#1 in the image). Because the error occurred here in the US, the left facing mini koala (#2 in the image) was only available to purchase in the US. The left-facing mini koala is one of the more highly sought after on the secondary market. The best estimates I have are that 5,000-10,000 mini koalas were sold in the US the first year (1989) they were available. With the repeated cycles of production errors/corrections, about 600 – 800 were made facing left. Just a final suggestion … If you are fortunate to have the left-facing Mini Koala or are considering to purchase one, be sure to compare the crystal figurine to the label on the box to ensure that the label shows a left facing one. (A right facing mini koala on the label may suggest that someone has altered the piece). 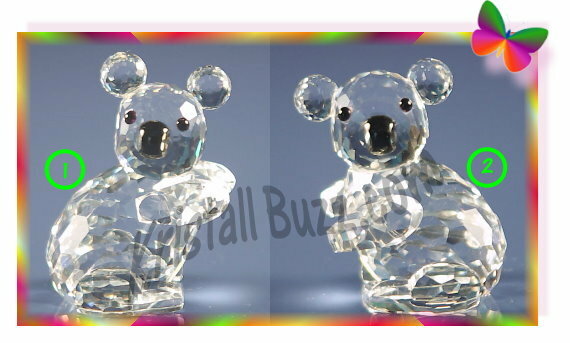 The Swarovski Koala crystal figurines (in all four size / variation combinations), as well as the Swarovski Koalas can all be found at Crystal Exchange America. Go to the website: www.CrystalExchange.com and use the search box to see the ‘koala’ figurines presently available. Swarovski Bo Bear – Heavy Metal. This Lovlots Bo Bear sounds like he may be a punk rocker, or perhaps the goth one in the group with his dark, skull attire. Swarovski Bo Bear – Naughty But Nice. This Lovlots Bo Bear will be ‘the one to watch’. He’ll be appearing as both an angel and a devilish figurine. Swarovski Bo Bear – So Brilliant. This Lovlots Bo Bear will have 70 crystals set in the Pointiage® technique. Swarovski Bo Bear – So Sweet. 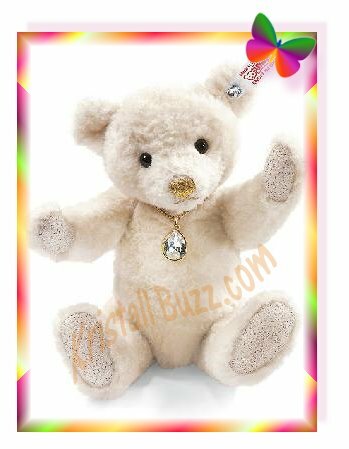 Swarovski does not say much about the characteristics of this Lovlots Bo Bear, only that it is a great way to say “I love you”. They leave it to our imagination! Swarovski did not include any product images with the news. From the sketch of teddy bears with the announcement, the Bo Bears appear a bit ‘Hello Kitty’-like to me with a large head and product cuteness drawing in the consumer collector. The crystal brand did some product realignment at the beginning of the year, with the end result being that the Swarovski Kris Bears are Lovlots Kris Bears. Hopefully the Kris Bears will be glad to see the Bo Bears in their Lovlots city turf. In the Swarovski News announcements to its SCS members, the company reveals that the Swarovski Bo Bears will not be ‘exclusively crystal’ figurines. They provide a hint that there will be ‘other various materials’. Yet another aspect that Swarovski is leaving for crystal fanatics to figure out. Swarovski Bo Bear figurines will be available on the online shoppe in early July. About 1 week later, there will be accessorizing jewelry and charms in the online shoppe. There is no mention of figurine size or price point. Perhaps since Swarovski is incorporating ‘other materials’ into the products, these teddy bears may be less expensive?